By Dennis W. Viau; a standard recipe. Homemade chicken stock is inexpensive because you make it with the parts of the chicken you throw away, the trim. How much does it cost for a carrot, an onion, and a couple stalks of celery? This chicken stock, besides being delicious because it is homemade, is practically free! In a previous installment of these recipes I showed how to bone a chicken. What do you do with the scraps? Make stock. Homemade chicken stock is essential in gourmet cooking. You can buy stock in the store, but the canned product is more like a broth than a stock. The difference is in the gelatin, which is derived from the bones and cartilage. This gelatin adds body to the stock and gives soups their silky smoothness. Broths are made primarily from meat or vegetables. Place chicken bones and skin (not the liver, which adds bitterness) in a 6- to 8-quart (5.7 to 7.6 liters) pot. Add the water, chopped vegetables, and herbs. Add any additional flavorings you might want, but keep it simple. The simpler the stock, the more uses it will have. Bring the pot to a boil over high heat with the cover off and then reduce heat to low. Skim off the scum that rises to the surface until it stops appearing. Simmer the stock 1 to 1½ hours. Avoid a rapid boil, as this can make the stock more cloudy. Remove from the heat and allow the pot to cool until the contents are cool enough to handle safely. Use a slotted spoon or other strainer to remove the solids, placing them in a colander over a clean bowl to catch the drippings. Filter the stock through a chinois (conical strainer) or other strainer. Pour it into a large bowl, along with the drippings captured from the solids, to let the fat rise to the surface. Discard the solids. Taste for salt, if desired. If you plan to use the stock to cook beans, such as when making Pasta Fagioli, do not add salt. Cover the bowl with plastic wrap and refrigerate overnight to allow the fat to float to the top and solidify. The following day, skim off the solidified fat and discard. Spoon out the gelled stock, avoiding any solids at the bottom of the bowl, and place in a clean pan. 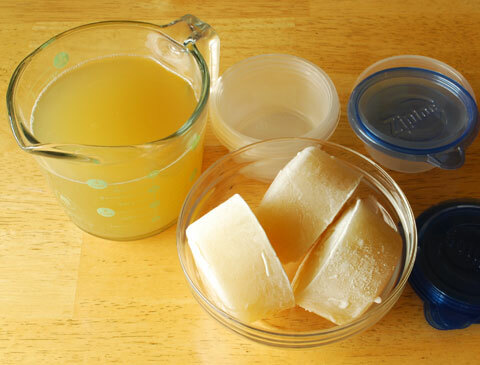 Melt the stock and pour into one-cup plastic containers for freezing. When frozen, pop out the solid stock and store in zip-lock bags in the freezer. Use for soups and sauces.